당진 영탑사 금동비로자나불삼존좌상(唐津 靈塔寺 金銅毘盧遮那佛三尊坐像)은 신라말에 도선국사가 창건하였다고 전해지는 영탑사에 모신 불상으로, 8각형의 연꽃무늬의 대좌 위에 본존불인 비로자나불이 있고 양 옆으로 협시보살이 있는 삼존불(三尊佛) 구도이다. 본존불은 머리에 작은 소라 모양의 머리칼을 붙여 놓았으며 그 위에는 상투 모양의 머리(육계)가 큼직하다. 사각형의 얼굴은 원만한 느낌을 주며 선으로 표현된 옷주름은 도식화되어 보인다. 상반신은 길고 큼직한 데 비하여 하반신이 무척 위축되어 있어 불안정한 느낌을 준다. 무릎 높이도 상반신에 비하여 낮아서 몸의 균형이 고르지 못하다. 가슴 역시 평면적이며 하반신 처리는 둔중하게 하였는데 이러한 수법은 고려 중기 이후 나타나는 특징이다. 손은 비로자나불이 취하는 일반적인 모양으로 왼손 검지를 오른손으로 감싸고 있는 모습이다. 왼쪽 보살과 오른쪽 보살은 모두 같은 자세에 똑같은 수법을 하고 있다. 머리에 쓴 보관(寶冠)은 따로 만든 것이며, 그 안에 머리묶음이 높이 솟아 있고 머리카락은 길게 어깨까지 내려온다. 얼굴은 본존불과 기본적으로는 같으나 좀더 여성다우며, 가슴의 목걸이 장식은 유난히 크다. 잘록한 허리에 둘러진 천의(天衣)는 몇 가닥 띠로 허리를 잔뜩 졸라 맨 것처럼 보이게 하였다. 이 보살들의 대좌(臺座)는 본존불의 대좌에서 나온 두 개의 연꽃 줄기가 올라가서 만든 연꽃 봉오리이다. 이 금동불상은 구도와 형태 등에서 고려불상의 특유한 특징을 보여주는 작품으로 평가된다. Yeongtapsa Temple is located on the side of Sangwangsan Mountain in Dangjin, Chungcheongnam-do and faces southeast. It is said that it was built in late Goryeo by State Preceptor Doseon, but this is not confirmed. On top of an octagonal lotus flower-patterned pedestal is the Vairocana Buddha statue, the principal image, with assisting Bodhisattva statues on each side, forming a Buddha Triad. The topknot-shaped usnisa (a protuberance symbolizing supreme wisdom) on top of the curly hair is large, and the rectangular face is plump. 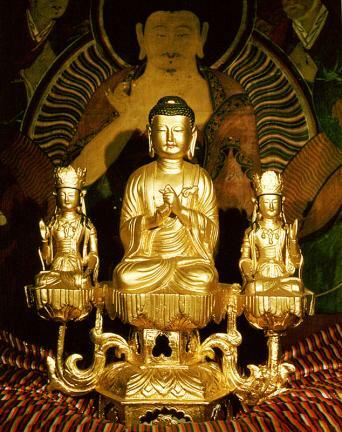 The hands are in the jigwonin position (the mudra symbolizing Buddha and the multitude are one), with the right hand covering the left index finger, making it easy to see that it is a Vairocana Buddha. The folds in the clothes are diagrammatic. The upper body is large and long, while the lower body is comparatively small, making the statue look unstable. The knees are positioned low, making the whole body look unbalanced. The chest is flat, and the lower body is especially dull. This style can be seen in statues made after the mid Goryeo Dynasty. The Bodhisattvas on either side are in the same position, carved in the same style. The crowns on their heads are made separately, with the usnisa sticking up high inside them, and the long hair coming down to the shoulders. 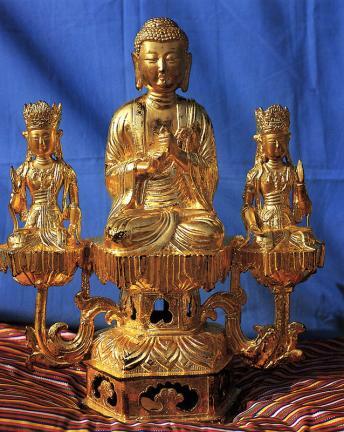 The faces are basically the same as that of the principal Buddha, but have more feminine features, and the necklace decorations on the chests are exceptionally large. The robes wrapped around the waist look like tightly fastened ropes. The pedestals of the Bodhisattva statues are lotus flower buds stemming from the pedestal of the principal Buddha. This gilt-bronze Buddha statue is regarded as a piece that shows the unique features of Goryeo Buddhas in both composition and form.